Our Biggest Plantation Shutter Sale Ever! If You’ve Been Thinking of Getting the Shutters You’ve Always Wanted NOW Is the Time to Buy! Get the shutters you’ve always dreamed of – at the best prices you will ever find – at our SHUTTER SALE. If you’ve had trouble finding “in stock” shutters – look no further. Other shutter companies order their shutters from oversea and – because of current dock strikes and shipping delays – shutters from most manufacturers will take months to arrive. Our shutters are MADE IN THE USA – so all of our components are in stock and your shutters will be custom made and shipped – with NO overseas shipping delays! But act quickly, our SHUTTER SALE ends June 30, 2015. At The Blind and Drapery Showroom we offer a wide selection of high quality custom plantation shutters and french doors. Our talented and experienced Interior Designers will come to your home to ensure that you get the window treatments that are perfect for your decor, at a price you can afford. We also have a showroom, conveniently located in Agoura Hills – just North of the 101 at the Kanan Exit – so you can see the quality shutters that you are going to buy. When you compare our price & quality to Costco, 3 Day Blinds and others, you will see that we offer superior products at the BEST PRICES around. Click Here to set up an appointment for a free, in-home consultation. Or call us at: 818-597-0440. Why Buy Plantation Shutters From Us? Unlike 3 Day Blinds, we have a showroom! So you can see what you are buying! 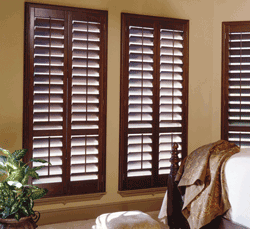 Unlike most other shutter companies, we use only shutters made in the USA. US Made shutters mean no long shipping delays from overseas manufacturers. Our safe, quality materials contain NO formaldehyde or dangerous off-gases. We’ve been locally operated for 20 years – we’re here if you ever need us. We stand behind our shutters! 10 year warranty on materials & installation. When you compare “apples to apples” our prices BEAT our competitors every time. Our no-pressure designers come to your home to design & measure your shutters. Our talented designers exclusively service the following areas: Agoura Hills, Calabasas, Westlake Village, Hidden Hills, Chatsworth, Camarillo, Malibu, Ventura, Topanga, Thousand Oaks, West Hills, Pacific Palisades, Oak Park, Somis, Montecito, Carpinteria, Santa Barbara, Newbury Park, Moorpark, Simi Valley, Northridge & Port Hueneme.